Wigwonders can only order Jon Renau wigs on a sale of no return basis.. I am unable to return any wigs due to cost, as I order direct from America..
Human Hair Collection, Each individual hair is hand tied to the lace, creating the illusion that the hair is growing from your own hairline. The most innovative lace front wigs on the market with the highest grade human hair available, with No Tape or adhesive Necessary! Super-stylish and unbelievably natural, each SmartLace wig is hand-crafted with the utmost quality with No Tape or adhesive Necessary! The new Jon Renau HD wig collection combines the easy wear ability of synthetic wigs with the flexible styling of human hair wigs in a beautiful array of naturally gorgeous options. Using breakthrough heat defiant fibers, Jon Renau HD wigs are designed to give you the power to reinvent your look day after day. Blow dry, flat iron, crimp and curl HD wigs just like natural human hair — the fibers can be styled with heat up to 350 degrees. This exclusive Jon Renau line weigh up to 50% less than traditional wigs by the use of lighter materials and machine-back open cap construction (also referred to as “capless”). This exclusive construction utilizes a double monofilament top which feels soft and silky inside the cap. Because this design replaces machine wefted strips with monofilament, it eliminates scratchy, irritating friction against the scalp. 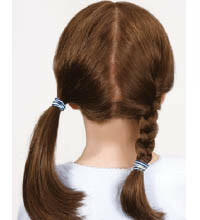 Made specifically for kids with lightweight smaller caps with low density wefts creating a natural youthful look. This classic collection are the original line which offer affordable choices in many styles.